Paul Clark has been providing quality taxi service in the Southern Indiana and Metro Louisville areas for over 18 years. When you choose Paul's Taxi Service you can rest assured you will get a clean cab and prompt service from an experienced driver. Paul prides himself on being on time. Set up your trip today by booking Paul online now. 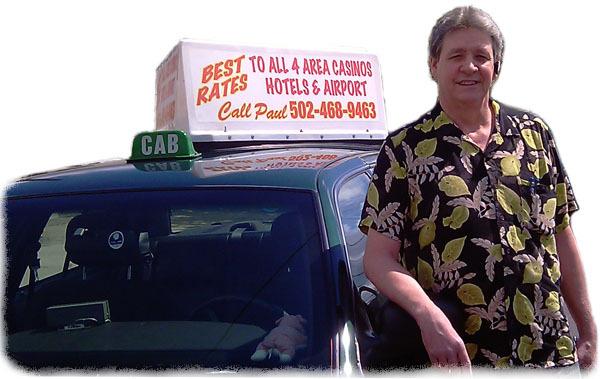 Paul provides service to Louisville, Ky entertainment districts such as 4th Street Live, Baxter Ave and pick up/drop off to Horseshoe Casino Indiana. Charter service for banquet halls and private events available. International travelers choose Paul if you want a knowledgeable experienced driver who knows the area well. Provides service to Louisville International Airport, Indianapolis Airport and Cincinnati Airport. Paul offers the best rates in town. Ask Paul for repeat customer and long distance discounts. Book a cab online with Paul now! This form goes directly to Paul, you will get a prompt response. You can find some fun and interesting things on Paul's Blog. He posts about what's going on in the Louisville area such as concerts, events, fine dining and much more.